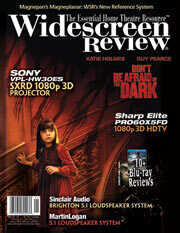 I received a DVD for Christmas and went to the newsstand to learn all about DVD movies and Widescreen TV. I picked up an entire different magazine and out of all of them, yours was the best. It is that simple. As a matter of a fact, I just subscribed to Widescreen Review.